Hey guys, could you please help me set up my audio system? My main unit is a Sony TA-F808ES integrated amp I got off ebay a month ago. It has issues and might be going back to the seller but if I can fix them I'd like to keep it. I can't find a free user manual for it online. Would anyone have any links? I have a Sony SDP-EP9ES A/V preamp that will take all my digital signals from CDP, DVD player and two functional LD players. I want to be able to enhance the sound from my CDP, sometimes use the amplified sound from my LD and DVD players through my good separate speakers (Sony AL5 Mk IIs) for music LDs and DVDs but sometimes I want to use my TV speakers on my KVHR-36 for non-music DVDs and LDs. How should I hook it all up? Using a pre amp with an integrated amp seems wrong but I've tested it with my CDP and results are good. The EP9ES has one analogue out and a "bypass" function. The TA-F808ES has CD and direct in as well as something called adaptor in and out. The KVHR-36 has analogue in. Sorry this post is probably not very clear. Little confusing, you are using the SDP for everything but then what are you using to enhance the CD player? Sorry yeah I'm being pretty unclear. The SDP's DAC should be superior the the CDP's (Sony CDP-991). First is it a good idea to run a pre-amp like the SDP into an integrated amp? Testing with the CDP-991 into the SDP and the SDP into the CD input of the 808 reveals it sounds good but having two volume controls is confusing and sometimes tricky to get balanced right. Second can I run a bypass or something through the 808 for non music content on LD and DVD? I want that to come out of TV speakers so I don't thrash my beautiful separate speakers. As I said the 808 has something called direct in and then something called adaptor in and adaptor out. Could I utilise these inputs in some way to switch from speakers to the TV without manually changing the connections each time? Really need an 808 user manual (not service manual)..would anyone here have one possibly? Thanks, hope I'm clearer this time but have a feeling I'm not.. I'm no massive expert in this type of thing but from what I know and remember. Your integrated amp should always be better than your SDP? and for things like 2 channel they would be better I believe. When I had an integrated, AC3 decoder and LD, DVD players etc. I ran everything into the integrated then the AC-3 into the decoder, I believe I also ran the LD regular to get the audio. So in the integrated I would basically shut off or bypass and only use the power/speaker section as there was a setting for such as I'm sure your Sony has the same. Its hard to ask and hard to explain but if you feel the SDP is better or equal then I would look into what you may need being a 6 channel power amplifier to connect for speakers etc. Just read a post of yours under another topic. Are you doing 2 channel???? Then you really don't need either of these and should go a nice 2 channel Sony or other company integrated amp, or even do separates. Okay, I gotta be clearer. The 808 only has analogue inputs, so to switch digital sources easily I need the SDP. Yes analogue direct from my CDP to the 808 is an option, but I think it actually sounds better digital from CDP to SDP than analogue from the CDP to the 808. The SDP "cleans up" the signal from the CDP, making the CDP just a transport, ie I believe the SDP has a better DAC than the the CDP-991. The SDP-EP9ES has a well regarded DAC and should feed the 808 a nice cleaned up analogue signal from any source. The only problem is the SDP only has one analogue output but I need to sometimes use my good speakers (hooked up to my 808) and sometimes my TV speakers. Now if there is someway to use these "direct in" and "adaptor in/out" on the 808 to redirect the signal from inside the 808, either to the speaker A terminals through the 808's power amp or to a set of RCAs that will be connected to my TV (from the 808)???? Oh OK I think I've go what you are asking. 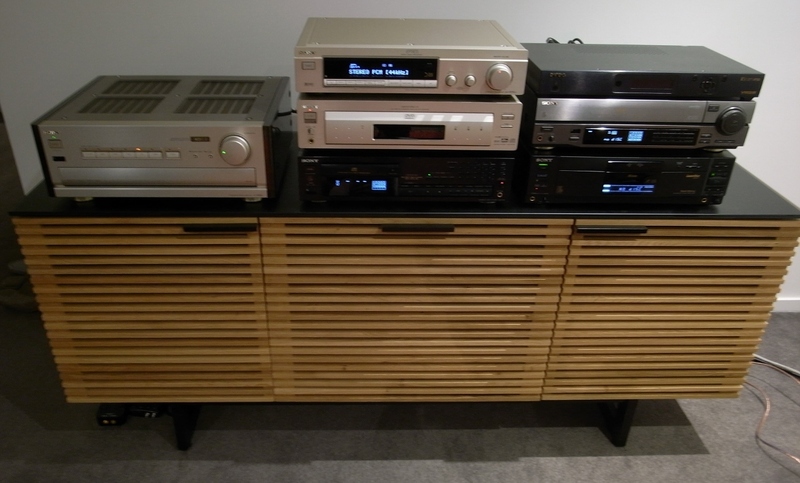 You want to run the CD player through both units to use either TV or regular speakers. The only think I can suggest is to pickup a stand alone switcher, either an audio only or audio video switcher and use the audio only. I have a JVC unit, its passive so no power and I've never seen any issue with messing up the audio or video. Mine is silver, but many companies make them, just look for one without any power, and you could also look or a speaker selector? You would have to connect these to the OUT of your CD player and then another set of cables. Only issue is that you need to make sure that you never really have both amps on at once or there could possibly be signal interference. Thanks hadn't seen those "piggyback" cables before. 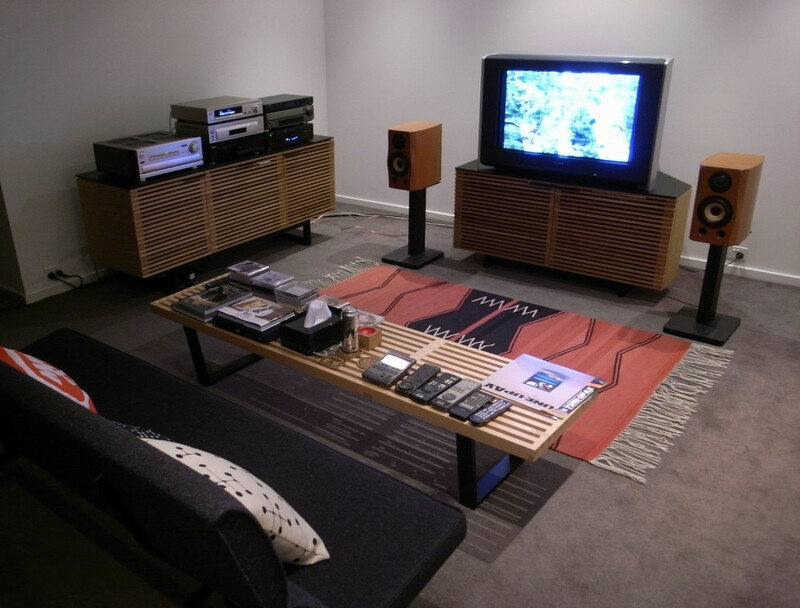 I'd never want to put my CDP through the TV speakers though, just DVD player and LD players for non music content. The good speakers are strictly for music. I wish there was a more elegant solution with these esoteric inputs on the 808. Has anyone got a user manual (not service) for the TA-F808ES available? but have had a few sets for years and they do come in handy with things like projectors to TV or audio from player to TV. Well I reordered from monoprice and this time it went through. Got my stuff so I could finally setup my system again. The 25 foot RGBHV cable works great, picture is just as good as it used to be over a much shorter cable. Also got some long runs of 14 AWG speaker wire and a huge stereo RCA cable so I can put sound through my TV if necessary quite easily now. I just use the adaptor out on the 808ES and it acts as a carrier for sound to the TV even with the amp shut off, no need for piggybacking or splitting the signal. Very happy except for the issues I'm still having with sound dropouts on the 808ES. Looks nice, I'm still just dealing with a 13 inch CRT in my workroom and TV in the bedroom. Nothing else connected yet, about to pull out the second LD player and get it ready for the rack. I think a lot of people believe the hype about the shorter /longer cables, if you get a 1 dollar cable its going to be crap no matter the length.